When I journey to a dark site, I ordinarily drive my car. This gives me the space required to pack my telescope and its equatorial mount, my aluminum ocular and accessory case and my Lowe Pro briefcase, which is stuffed with my old Celestron Nova 7x35 binoculars, an Orion 9x50 correct image finder and everything else I cannot fit in the ocular case. Oh yes, there is also a folding chair in the trunk and a couple of pillows for comfort. For me, this is as light as I need to travel and, yes, it all fits in the trunk of my Chevy Monte Carlo SS. However, there are those who really do travel light, of necessity. Some are backpackers and some are folks whose job or lifestyle requires a lot of airline travel. There are probably lots of reasons for traveling light. If these folks are also avid amateur astronomers, they probably own some sort of compact travel scope that they can take along, usually a 3.5-4" CAT or a small, short focal length refractor. Of course, using any telescope in the field requires some accessories. At a minimum, you need some sort of mounting system, a small red-light flashlight, perhaps a pocket guide to the night sky and oculars. The latter are the subject of this article. I got thinking about a rock bottom set of oculars after reviewing the Vixen NLV 8-24mm Click-Stop Zoom Eyepiece. (You will find that review on the Astronomy and Photography index page.) During the course of a conversation about this remarkable eyepiece, Editor Gordon Landers mentioned that the person traveling light would do well to own one, as it would cover most of his or her viewing needs. I agreed, but cautioned that you would also need a wide sky eyepiece, as the apparent field of view (AFOV) of the zoom decreases as the focal length increases. Just the opposite of what you'd want. It has a wide 55-degree AFOV at the 8mm setting, but this shrinks to only 40-degrees at the 24mm setting, making it more difficult than necessary to find dim objects in the night sky. Vixen NLV 8-24mm Click Stop Zoom Eyepiece. Illustration courtesy of Vixen Optics. That was the impetus for this little piece. Start with a Vixen NLV 8-24mm Click-Stop Zoom, which really does equal a good fixed focal length ocular (at least visually and in the center of the field) in sharpness, contrast and eye relief. 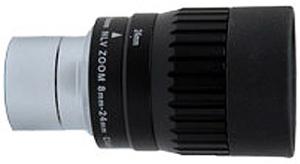 However, a long focal length, wide sky eyepiece is needed to complement the zoom's capabilities. Fortunately, these are available. Plossls of 32mm and 40mm focal length are readily available from most of the major telescope companies. 32mm Plossls have AFOV's of 50-52 degrees. The long 40mm Plossl typically has an AFOV of about 43-degrees. The way it works out, these two focal lengths have nearly identical actual fields of view. The extra focal length of the 40mm Plossl compensates for its narrower AFOV. In terms of wide sky views, they do the same job. The 32mm magnifies everything in its field of view more and the 40mm is brighter. Tele Vue 32mm Plossl eyepiece. Illustration courtesy of OPT. 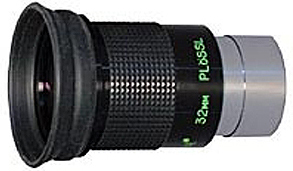 For most travel scopes, especially a short focal length refractor with a "fast" focal ratio, I think I would choose the 32mm Plossl, since the scope is probably bright enough, anyway. If your travel scope is a long focal length CAT, such as a Meade ETX-90 or a 3.5" Questar, you might prefer the 40mm Plossl. Either way, you are going to see a lot more sky than you would through the Click Zoom at its 24mm setting. *Substitute Celestron or Vixen Plossls as circumstances or preferences dictate.